Buy the highest and best Quality green coffee beans- roast them to perfection and ship within 24 hrs. after roasting direct to your door. All orders are custom roasted to your preference. The packages will have a label on the bottom to show the roasting date so you know exactly when it was roasted. We roast the coffee beans to your order and ship within 24 hrs after roasting. for 2 lbs or more. Coffee you buy in the store or specialty shops are roasted miles and days away from the store and it takes day's until it is being sold to the consumer. In May 2001 Coffeemaria was the roaster of the month on the online magazine. If you would like to roast your own we will sell you the green coffee beans of your choice. For more info how to roast please call us or send e-mail. For custom blend or private label please contact us. Ethiopian Harrar roasted coffee, 16 oz. Out of stock until new crop is coming in. Java Preanger,roasted coffee beans, 16 oz. 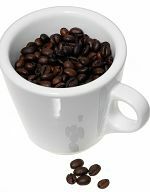 Tanzania Peaberry green coffee beans, 16 oz.